Happy Friday! It's hard to believe we are more than halfway through the year and this girl (pointing at myself) has still not achieved a good balance of work-blog-life, hence the lack of recent posts. It's been getting really intense in all of the important aspects of my life- career, fitness, blog, family, wedding, which at times has me overwhelmed, but thankful for these many opportunities and new chapters in my life. I'm so taking this weekend to get centered, refreshed (if possible) and not opening my work laptop (which is usually the end of me). What do you do to "refresh"? I hope you all have a wonderful weekend! Aww, I definitely get where you are coming from - but it's great that you have so many wonderful things in your life. All of your outfits are just gorgeous. Wow girl! Sounds like you have quite a bit on your plate! Hope you got some rest and relaxation in this weekend! I would say just get some "me" time in...away from a phone, laptop, etc. The beach and anything nature related always helps me:). I love all of your outfits especially #5. 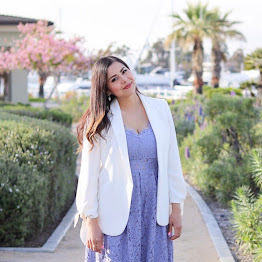 That lavender lace dress looks KILLER on you!